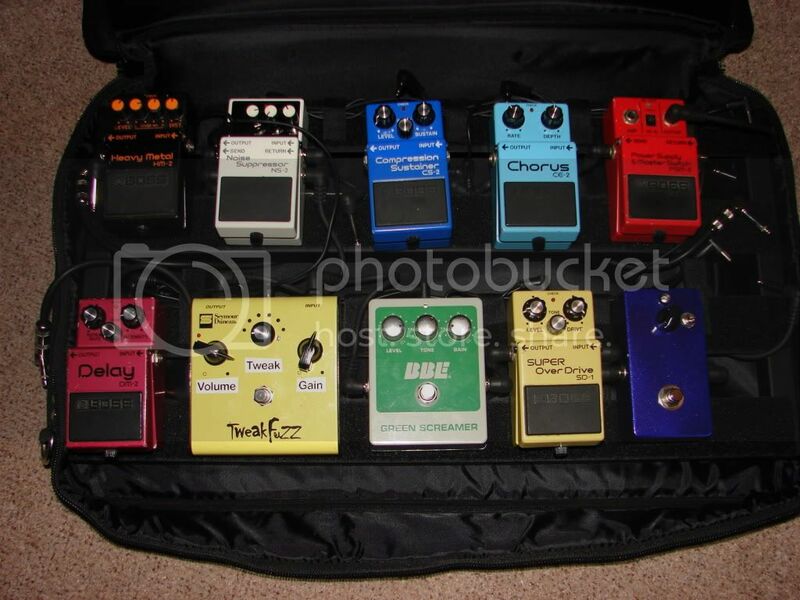 Posted: Sat Nov 27, 2010 10:09 am Post subject: Show me your pedal boards! 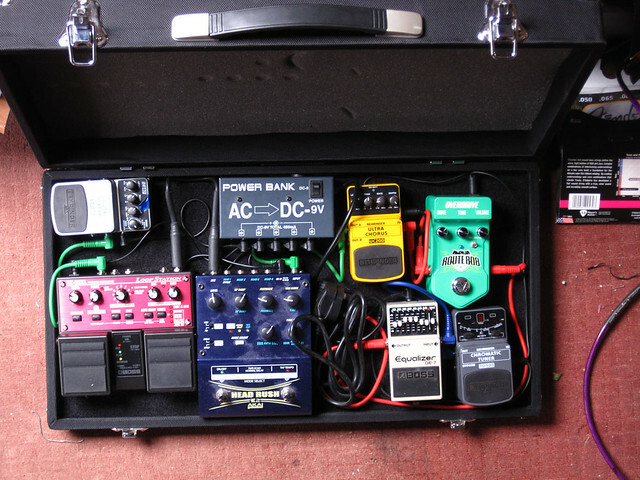 And now, after much faffing, rewiring and buying new pedals, I have my flash, double decker Swan Flightcase board. It's not quite finished yet, but it's on the way. Still to come: neater wiring (from Planet Waves patch kit), a compressor that works better than my home made BYOC one, a volume pedal (bottom right) and who knows... and maybe a(nother) boost. I justify all of these in that I play in an indie/pop band and use (nearly) all of these in our set. The Fender/BOSS reverb only gets turned on when I'm using my Ampmaker 18W clone and the looper is mainly for my own amusement. I was chatting to JohnA about this. I was perfectly happy with just a tuner for years and then I've suddenly gone pedal crazy in the last year or so. They're slightly less expensive to buy and collect than guitars too. Mine (a bit of a mess as it's in th eprocess of being pulled apart) There's no need for 5 distortion pedals, it was 6 until recently, just sold a zvex distortron! Say John, I believe some of these fine pedals are for sale, are they not? I agree. I went to my last band rehearsal without my pedalboard just to prove that to myself. I could play absolutely every song we do with just my two channel (reverb) amp - but I do also like that extra 10% polish that pedals can give some sounds. I've had a slight addiction to the little stomp boxes. I could seriously get into collecting them i think. 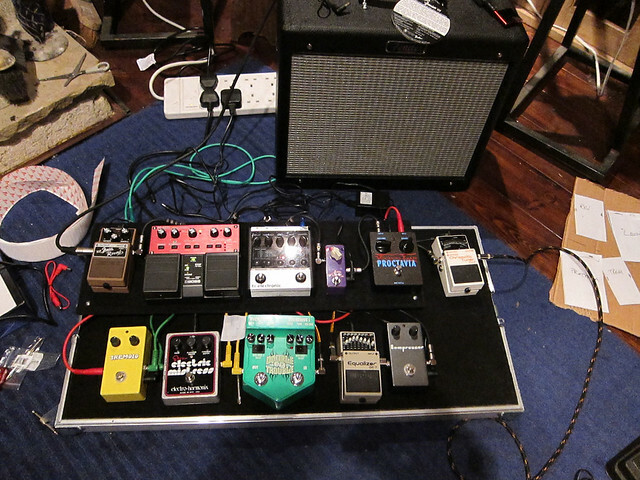 This is the current pedal board set up, before i've tinkered with it, again apologies on the not so good photo's. Nice - and well documented. What sort of music are you playing with all that modulation and freaky oscillation pedals? I am a bit concerned that at gig volume I might start to notice some of the artifacts I attribute to digital modelly things like pods and the like! When I've tried modelling amps they seem to not cut through like a valve amp, but I'm quietly confident that this little thing is going to cut it! Ironically, one of the things that put me off the TC Nova System, was getting the TC Nova repeater delay - it was so easy to just twiddle the knobs and get the sound that going through menus (which admittedly offer far more control) wasn't as appealing. I think thats why the stomp boxes are so popular. It's the fact you can just get in, and get the sound your after. The multi effects make sense to me, if i was in say a covers band. You could just program the sound your after, and then forget about it. My problem has always been I'm drawn to effects pedals that i know a) sound bonkers b) im never going to use them in a live situation.